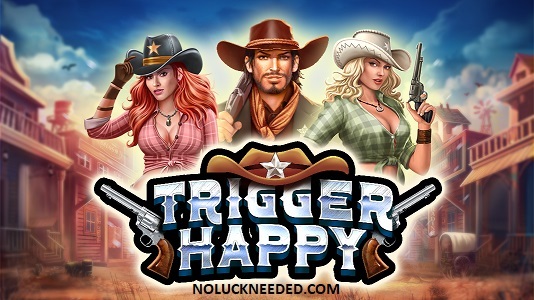 the new Trigger Happy slot from Realtime Gaming is sure to please cowboys, cow girls, and their wallets. 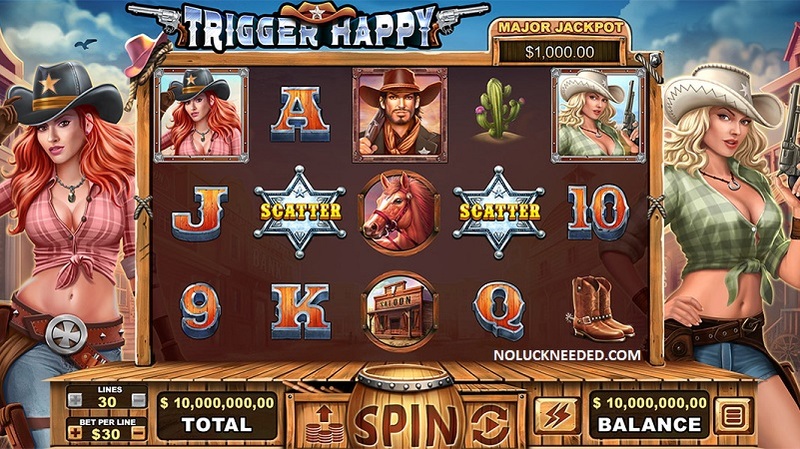 Trigger Happy is a new 30-line, 5-reel, wild west themed random jackpot vide bonus slot from Realtime Gaming Casinos. stop there because the Lucky feature may also be triggered at the end of any spin! at Realtime Gaming (RTG) Online Casinos. Please share your own Trigger Happy slot reviews after your play. Jackpot Reset: Amount Major: $ 1,000.00 Minor: $250.00 (Expressed in USD). · Progressive Jackpots can be won at the conclusion of any game. · The Jackpot is triggered at random. · Progressive Jackpot wins are added to other wins. · Random Jackpot contribution is no more than 1.5% of total Return to Player. "Sheriff Bagde" scatters appear anywhere on a normal game. · Choose either the Redhead Cowgirl or Blonde Cowgirl to double wins during free games. · One of two bonuses will also be awarded. · Any 3 or more scatters appearing during this feature adds 5 extra free games. · Free games are played at the bet of the triggering game. · The Redhead Cowgirl covers reel 1 during the free games. · The Blonde Cowgirl covers reels 4 and 5 during the free games. · Trigger A random Lucky Feature may trigger at the end of any normal game. · Either the Trigger Happy Feature or Lucky games will be triggered. · From 5 to 10 free games are won if Lucky games is awarded. · The Trigger Happy Feature may be triggered during Lucky games. Please share any Wild West free spin codes you find! They should be out soon. No max cashout! Standard terms apply. If anyone sees a new slot inetbet or Kudos freebie please post it here! Thanks! Standard free bonus terms apply including max cashout, max bet and wagering requirements. How to get your bonus? Go to the cashier’s ‘Coupons’ section and enter coupon code TRIGGER33 after making a deposit between March 20th to March 27th. I have PM's stuck in my out box for you. Can you get the. laura8393, I got them this morning! Thanks so much for the codes! ** CAN BE CLAIMED 2x BUT A DEPOSIT MUST BE MADE IN BETWEEN. Thanks to shirlsplay for the code!